The key to a good exit strategy is to know where you are getting out of the trade before you get into the trade. You need to identify where you would get out with a loss or with a gain. By having an established exit strategy, you put yourself in a position to keep your emotions out of the decision making process. The last thing we want to do as a trader is to make decisions based on fear and greed. Experience tells us that those type of decisions are not part of a successful approach to trading. We want to know where we intend on exiting before we get into the trade, which means that our decision is based more on solid analysis, which can lead to better trading results. The savvy trader knows where they will exit with a loss before they open the trade. They will immediately place their stop order in the market after entry. If you sell to open a new trade, then you place a protective buy stop order in the market to protect you if the market moves against you. The idea is to be close to your entry to keep the risk lower, but not so close that you are stopped out of every trade. 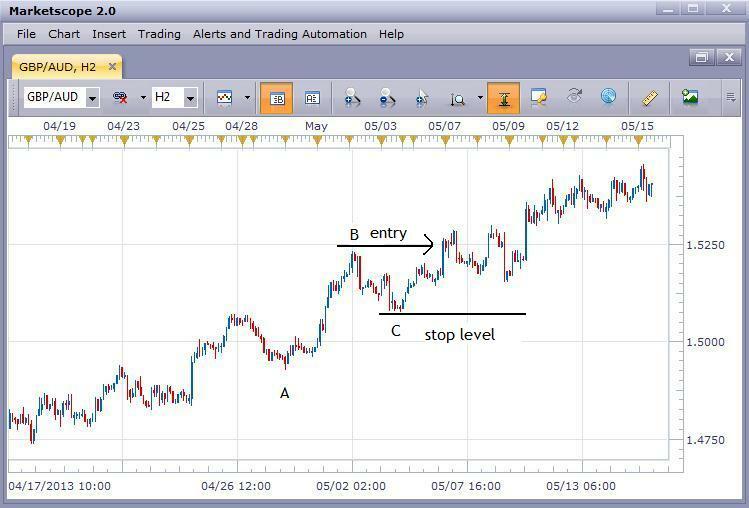 Many new traders struggle with this, but if they used the “ABC” approach to identifying an entry, the initial protective stop loss placement is easy. Let’s go back to our USD/CHF chart from the previous lesson. This 8-hour chart of the USD/CHF shows the downtrend and the entry after having identified our “ABC” pattern. We sell on a move down through point B and then simply place our initial protective stop just above point C.
The thought process is that after the market moves down through point B, which offers a certain level of confirmation that the downtrend is intact, if the market were to reverse and move back up through point C, then the trend would not be as strong as we thought and it would be better to be out of the trade. This 2-hour chart of the GBP/AUD shows the uptrend and the entry after having identified our “ABC” pattern. We buy on a move up through point B and then simply place our initial protective stop just below point C.
Identifying your initial protective stop level is key to a trader’s results. The difference between the entry price and the initial protective stop is the trader’s risk on the trade. Without knowing the risk on a trade, it makes it more difficult to know where to exit with a profit. Once you enter into a trade and then enter your initial protective stop loss order, many traders will now enter their limit order to take profits on the trade. There are many exit strategies. Some traders will stay in the trade as long as they feel the trend is still intact. This is fine for experienced traders, but new traders need something a little more “automatic” to make sure they remain consistent in their approach to trading. We recommend the use of a simple 1:2 risk:reward ratio. 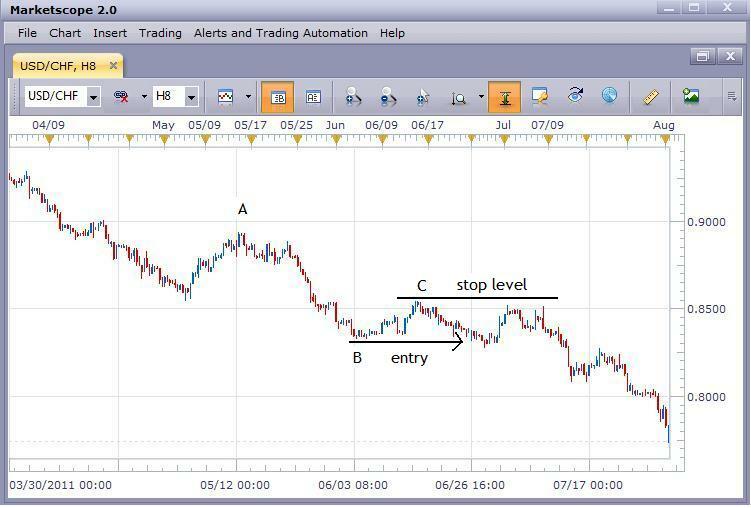 Otherwise, if your initial risk on the trade is 100 pips, then set your profit target for 200 pips. So the trader is looking for twice in profit, what they are willing to risk. The reason that this can be attempted is that the trades are all placed in the direction of the trend. That becomes the trader’s edge. It is the trend that has the ability of offer twice the risk in potential profit. So picking the right trend to begin with does allow everything else to fall right into place. Copyright 2019 TradingWaves. All rights reserved.